﻿Monte Vista On-Line Academy is a free, public, online school serving enrolled students in grades 4 -12 anywhere in the state of Colorado. 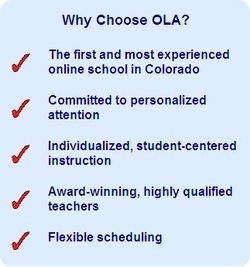 OLA is fully accredited by the Monte Vista School District through the Colorado Department of Education and is certified by CDE as a public multi-district online school. We have a highly qualified, award-wining staff of certified teachers delivering standards based courses using the Internet as the primary delivery system. OLA began in 1997, and has been quietly meeting the educational needs of students whose particular situations preclude the traditional public school setting. Students enroll in a robust and challenging instructional program, which accommodates individual student needs while providing a quality education. A significant proportion of students completing their high school educational program through the On-Line Academy continue their formal education through college attendance, and OLA transcripts are no different than other Colorado school transcripts for college admissions purposes.